In the Orr and Boudreaux trials, the Plaintiffs were not allowed to introduce Xarelto labels and instructions from other countries, a peer-reviewed publication about PT testing, or a draft letter from Bayer about the benefits of PT testing. If the Plaintiffs could have admitted these three exhibits into evidence, the jury could have seen that other countries require Bayer and Johnson & Johnson to warn about side effects, tests, and risks that they failed to warn about in the United States. Also, this evidence tends to prove that the makers of Xarelto were and are aware of its risks as well as the ways that doctors can protect and monitor their patients by performing PT tests. In the Mingo case, there was evidence discovered two weeks after the start of the trial. When evidence is discovered after trial begins, the court may grant a new trial. The new evidence was a scientific study and scholarly article that showed the benefits of PT testing, specifically in relation to Xarelto. Further, the study and article were performed and co-authored by six of Bayer’s scientists and two Bayer consultants. This evidence directly conflicts with what Bayer and Johnson & Johnson said at trial and therefore could have likely changed the outcome of the trial. In the Boudreaux case, Dr. Peters, a doctor of Bayer and Johnson & Johnson, was allowed to talk about his wife’s use of Xarelto and his opinion of the drug’s safety and effectiveness. This evidence was wrongfully admitted since Dr. Peters was testifying in a professional manner, not a personal one, and since he was not the doctor who prescribed his wife the medicine. 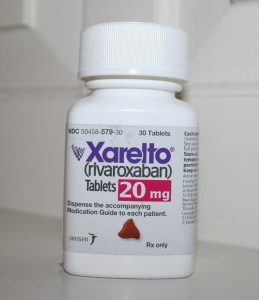 Nevertheless, the jury heard this evidence and used it in determining that Xarelto is safe. In all three cases, plaintiffs allege that the court gave the jury instructions that were inadequate. Rather than providing the clear instructions proposed by the Plaintiffs, the court failed to instruct and explain about federal regulation requirements that arise when a laboratory test aids in identifying effects and reactions to a drug, and the liability of a drug maker when he fails to advise doctors of these tests and effectively fails to warn. In turn, the juries were left confused and without a clear idea of how liability may be established. For these reasons, the Plaintiffs argue that the three defense verdicts should be reversed and new trials should be ordered. While only three trials are directly at issue now, there are over 20,000 pending cases in the MDL that may be affected. You can follow along with the massive Xarelto multi-district litigation and these three appeals here. You can also contact me if you have any questions or concerns.